These sweet little nut filled pastries are another recipe that my mom used to make for the holidays. My uncle Joe called them Hungarian nut rolls. They are made with a yeast dough, but the method is a little different than other dough I've worked with in the past. The keys to success are keeping everything cold (the dough gets sticky when it gets warm) and working gently with the dough. Blend only until mixed, bake only until lightly browned. 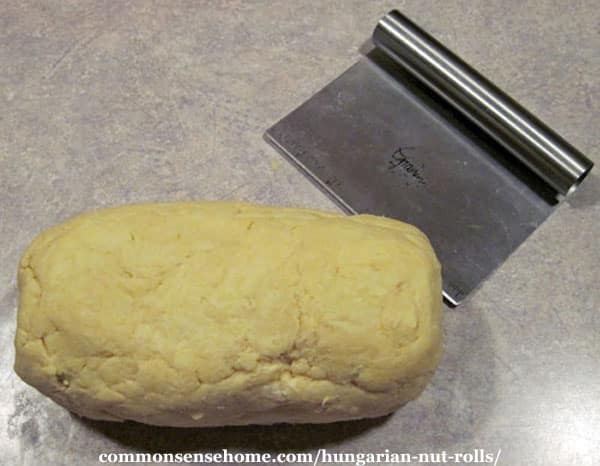 These Hungarian nut rolls can be made ahead and frozen in layers stacked between waxed paper. They store quite well – easily a month or more in the freezer and a week or two chilled or on the counter in a sealed container. Mom always made them ahead so she didn't have quite so much to do on the day of or the day before the event. 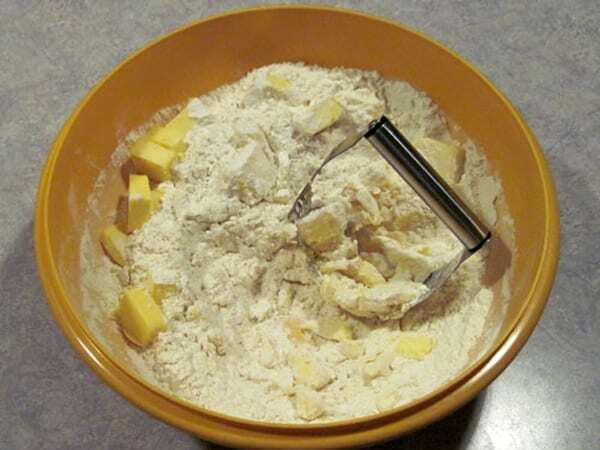 In a large bowl, mix flour and yeast, cut in butter with pastry blender. Whisk together three eggs and sour cream, then add to dry mixture. Mix gently until dough just holds together. Do not overmix, or your dough will get tough. 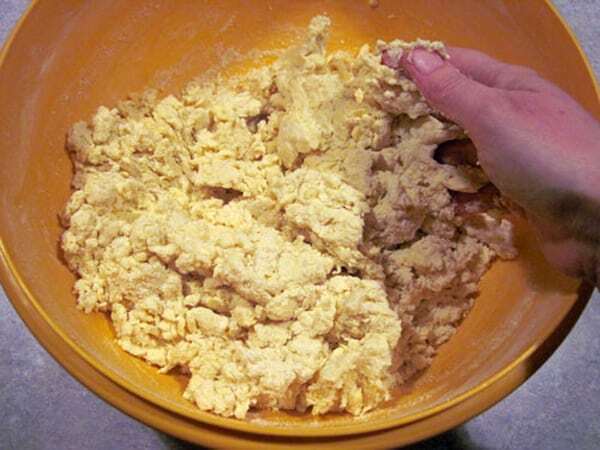 Form dough into large roll. Place each disk between wax paper. Refrigerate overnight. For filling, mix walnuts, egg whites and sugar. Set aside. Roll disk between wax paper with powdered sugar to about 12″- thinner than pie crust. (Sorry I missed photos of this!) Dusting your wax paper with flour will help keep the dough from sticking, as will keeping everything as cool as possible. Cut into 8 wedges/triangles. 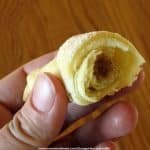 Put about a teaspoon of filling on the wide end and roll up like crescent rolls. Curl them fairly tight, as they like to straighten during cooking. Place the nut rolls on well greased pan or pan lined with parchment or reusable parchment. I prefer using air bake pans for these so they don't too brown. Bake at 350°F for 10-15 minutes, until just lightly browned. (On the airbake pans it takes around 15-16 minutes.) Dust with powdered sugar while still warm. (I like to use my Pampered Chef Sugar Shaker.) Move to wire rack to cool. Makes about 4 dozen. As you can see from this cross section, these little treats bake up light and flaky with a tasty nut filling. 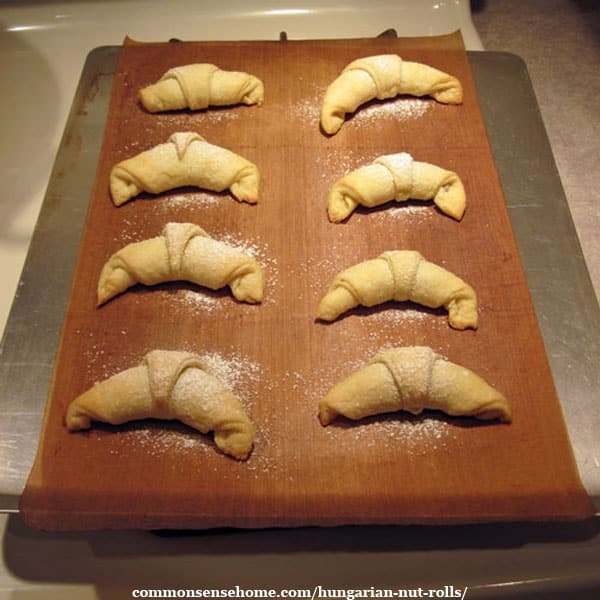 Hungarian nut rolls are a delicate, flaky pastry with a lightly sweetened nut filling. A favorite holiday tradition in our family, they can be made ahead and frozen. 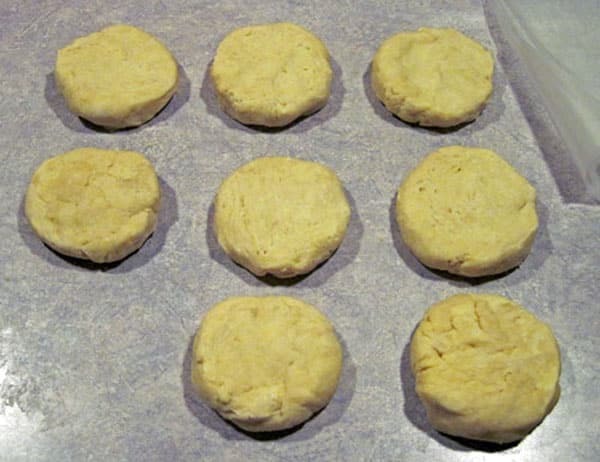 Form dough into large roll, divide dough evenly into 8 disks. Roll disk between wax paper with powdered sugar to about 12″- thinner than pie crust. Dusting your wax paper with flour will help keep the dough from sticking, as will keeping everything as cool as possible. Cut into 8 wedges/triangles. Put about a teaspoon of filling on the wide end and roll up like crescent rolls. Curl them fairly tight, as they like to straighten during cooking. Place on well greased pan or pan lined with parchment or reusable parchment. Move to wire rack to cool. Makes about 4 dozen. 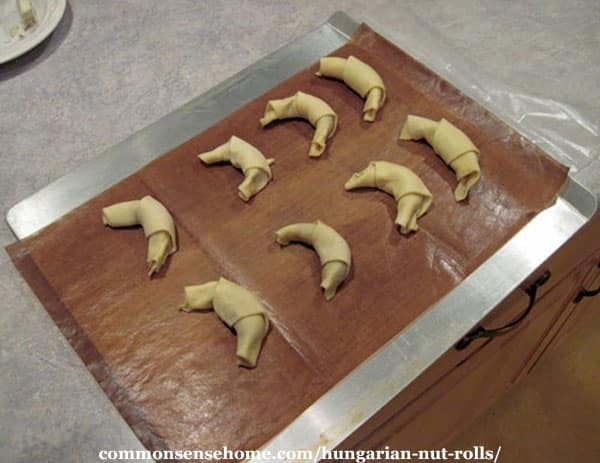 With a cup of coffee or tea these Hungarian nut rolls are really quite sinfully delicious. Once in a while mom made these with poppyseed filling, too, but I suspect that might have been because she misjudged the amount of nut mixture per roll and ran a little short. Whatever the reason, those were tasty, too. I'm sure you could substitute honey for the sugar, too, to give these more of a baklava flavor. Just remember than honey is sweeter than sugar, so you should reduce the amount by half. Thanks to my friend, Emma, for helping me get this recipe back (I had lost my copy). My niece, Kira, helped roll out most of these Saturday night while I did the dishes, so a big thanks to her, too. 🙂 We had a nice visit (her brother helped make kolache earlier in the day). 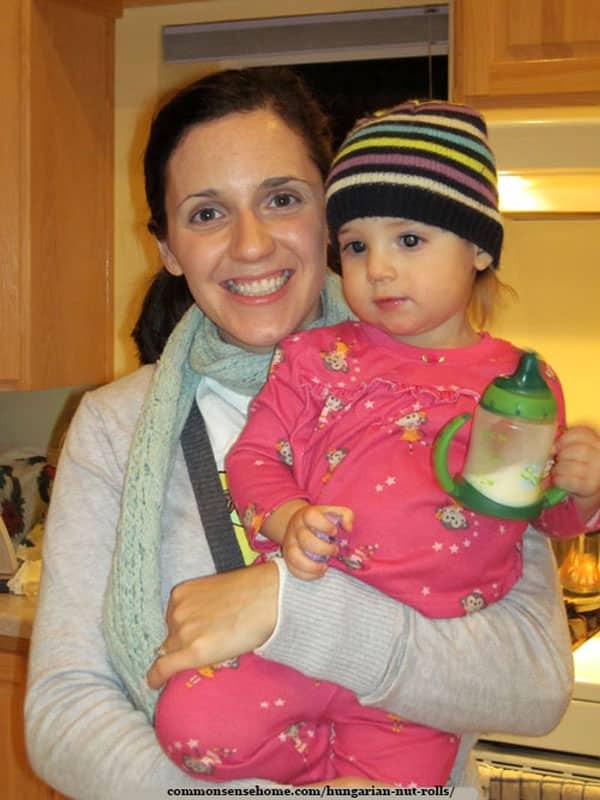 Here's my niece with her baby girl, Brit. mmmmmmmm… sinfully delicious, i bet…. i most likely would o.d. on those! oh my gosh! These are a tradition in my hubby's family.. they call them Kipfels. I have made them every one of the 10 years we've been married and still can't make them as yummy as my MIL does! Looks delicious- I wish I could digest nuts. I'm sure you could use a different filling. If I get some time I'll try. 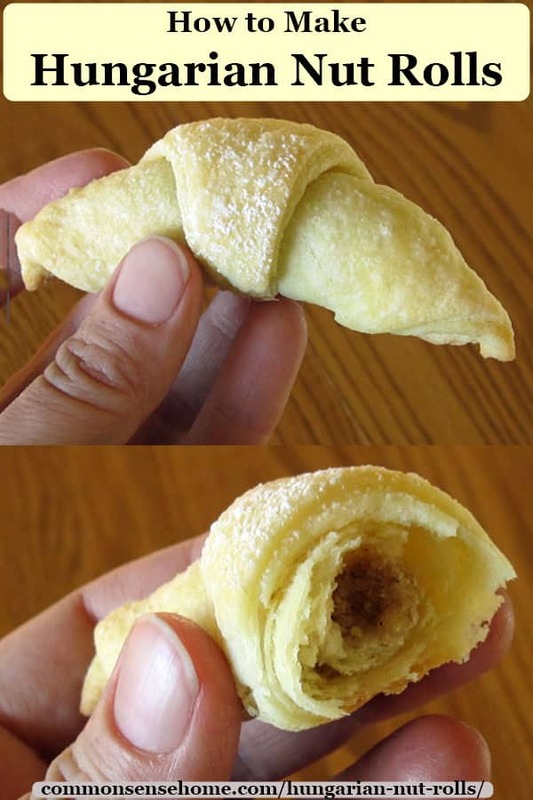 My mom also used apricot filling at times, if those are better for your stomach. The sweet-tart taste was a nice contrast to the sweet pastry. 🙂 my family calls them Cold Doughs 🙂 we make them for Christmas every year, long time family tradition from my Hungarian grandma. We do the nut and apricot filling. ANY CHANCE THESE WOULD WORK GLUTEN FREE? MANY OF US ARE GLUTEN FREE. I haven’t tried them with a gluten free flour blend. I suspect the texture would be less than ideal but the product would be edible. She makes them with nuts like you do, but for the real central European experience she also makes them with black plum jam (“povidol”). The sour cream in the pastry makes them so decadent. Thanks for sharing part of your family’s story, Naomi. It sounds like the “black plum jam” may haven been made from prunes? Mom used a prune filling for her kolache, and I know dried fruits are quite popular for kolache fillings, so maybe they were used for kifli fillings, too? Sure looked like my mother’s, but besides not ending up looking as good, it seemed the sour cream was overwhelming. I wonder if it ought have been cream cheese instead? No, it’s sour cream, not cream cheese. Unfortunately, there’s now a wide variation in the quality of sour cream, so it’s possible that may have been the issue. I normally use Organic Valley, or Deans if they are out of Organic Valley, but avoid Daisy because it doesn’t work well in recipes and upsets my youngest’s stomach. Those are the three brands we have most readily available locally. Everything should be kept chilled, too. Different flours will also impact the final product, too. I’m a fan of King Arthur or Bob’s Red Mill.